“Show me a ‘J Stroke,’” said Brian, a certified Junior Maine Guide instructor sitting in my canoe. As I struggled to paddle up the river, the questions continued. “How would you fix a canoe after it hit a log?” “How would you load a canoe if you were going down rapids?” As Brian fired questions at me, my confidence in becoming a Junior Maine Guide began to fade. As I docked the canoe, I had a gut feeling that I had failed even though I had spent hours that summer paddling around the lake practicing my canoeing skills. With my head hung low, I trekked back to our campsite to start preparing for the next test. After a week of additional tests including meal preparation, first aid, and shelter building, I returned to Birch Rock Camp. 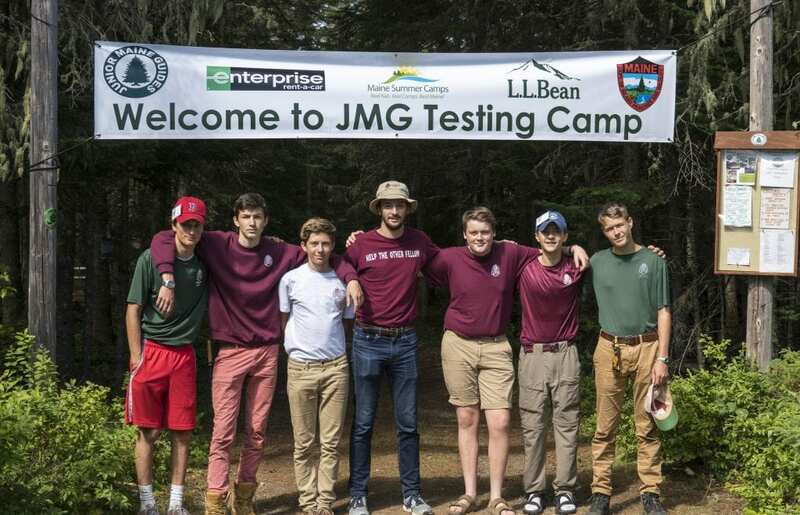 I had mixed feelings—relief that the stress of JMG Testing Camp was over, and anxiety wondering whether I had passed. For seven years, I spent seven weeks of my summer at a small outdoor boys camp in Maine. On the shores of Lake McWain, Birch Rock Camp was a second home for me. Building fires, chopping wood, and sharpening knives were just part of an average day at Birch Rock. Each summer, I met many people who I admired, but the most impressive of them all were the small group of Junior Maine Guides. They were leaders, problem-solvers, and true outdoorsmen who had passed a rigorous week-long test in 21 essential outdoors skills. The summer of 2016, when I was sixteen years old, was finally my chance to put my knowledge and camping experience to the test and prove I had what it took to become a JMG. The last week at Birch Rock that summer was difficult. Everyone felt the need to ask if I had passed just so I could tell them again and again that I didn’t know yet, but I did know I wanted to be a JMG more than anything. On Thursday, I saw Gabe, the JMG counselor at Birch Rock, walking to breakfast with a manila envelope. I sat at the table unable to eat, my mind and heart racing. Sliding my eggs to the other side of my plate for the hundredth time, I felt a tap on my shoulder. It was Gabe. I knew this was the moment I had been waiting for since I first learned about JMG as a young nine-year-old boy. I could see Gabe’s lips moving, but I was lost in my thoughts. “Chris, you worked really hard…” Confused, I tore the envelope open. My eyes fell to the bottom of the letter: RETEST. With what little energy I had, I thanked Gabe and then headed straight for my cabin. After my initial feelings of hopelessness and failure faded, my thoughts turned to next summer. I knew that JMG Testing Camp hadn’t seen the last of me. I was going to come back for a second year and pass! I spent the off-season reading the training manuals and when I had the chance, building fires in my home fireplace. I even practiced first aid on friends and family when needed. Before I knew it, the summer of 2017 had arrived; my chance to become a JMG returned. I moved through the same challenges with Gabe at my side, teasing me, as he cheered me on. In the blink of an eye, Testing Camp was over—but this time, I knew I had passed. Back at camp, I was more anxious than ever. Finally, Gabe pulled me aside and, with a big smile on his face, handed me the envelope. With a feeling of déjà vu, I tore it open. After two years of hard work, a feeling of great accomplishment and joy came over me. There, printed in big blue ink: PASSED.